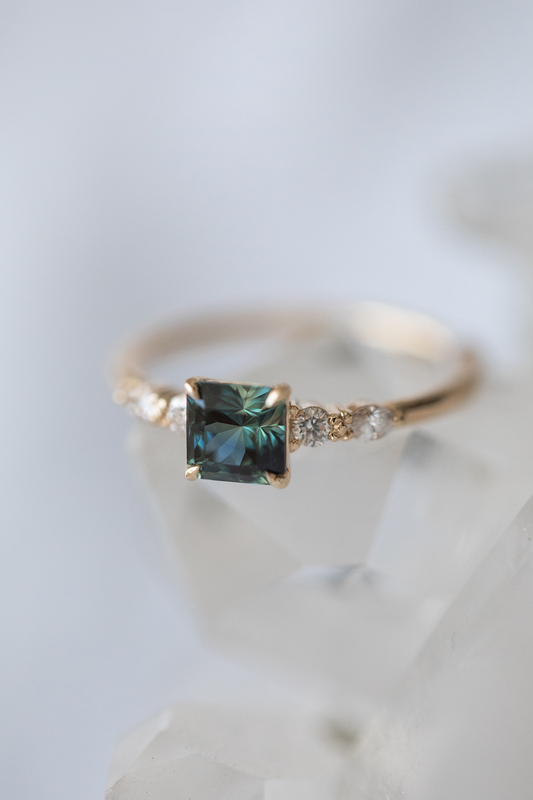 A couple of years ago, we shared this “Ditch the Diamond—Alternative Engagement Rings Featuring a Colored Stone” and our love for gemstone wedding rings has only grown tenfold since then! And, we’re pretty positive that many GWS readers feel the same way. Yes, diamonds are beautiful, but gemstones are different; they’re striking, they’re bold, and oftentimes, they’re less expensive than their diamond counterparts. 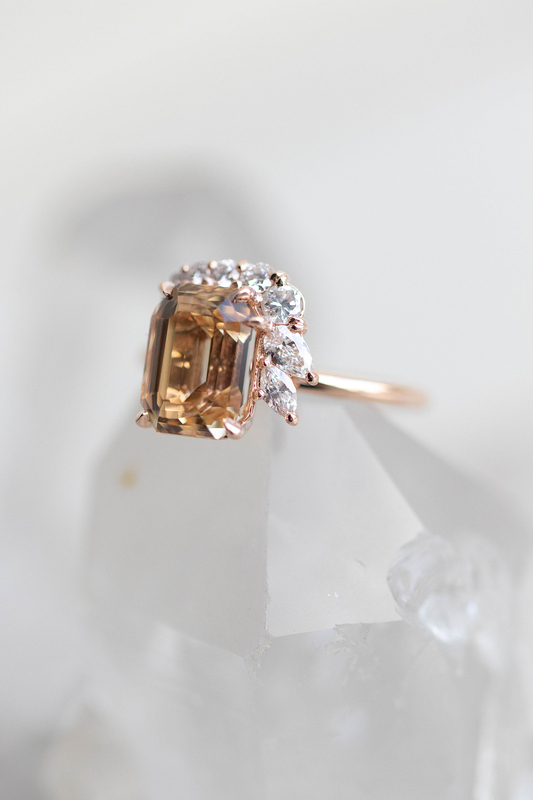 So, are you considering rocking a gorgeous gemstone in lieu of the traditional diamond? 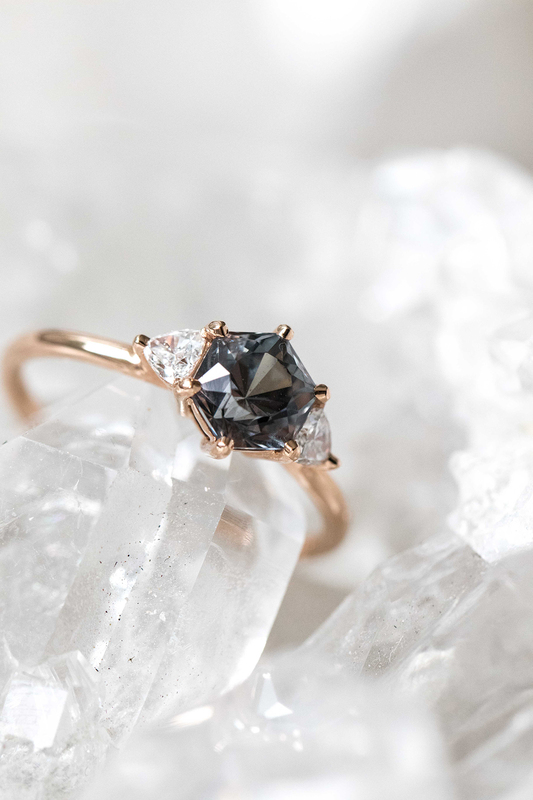 We spoke with Gabrielle Grew, of Sydney jewelers Grew & Co, who believes that more millennials are ditching diamonds in favor of gemstones and she’s here to give us the lowdown! Take it away, Gabrielle! Lifestyle-chasers, adventure seekers, travel junkies and non committal are all labels slapped onto the millennial generation. However, with millennials representing over 35% of the Australian workforce, it’s no wonder brands are shifting gear to ensure millennial customers are accounted for. Millennial brides are seeking unique colors, rarity and non-classical shapes when it comes to their gem choices. 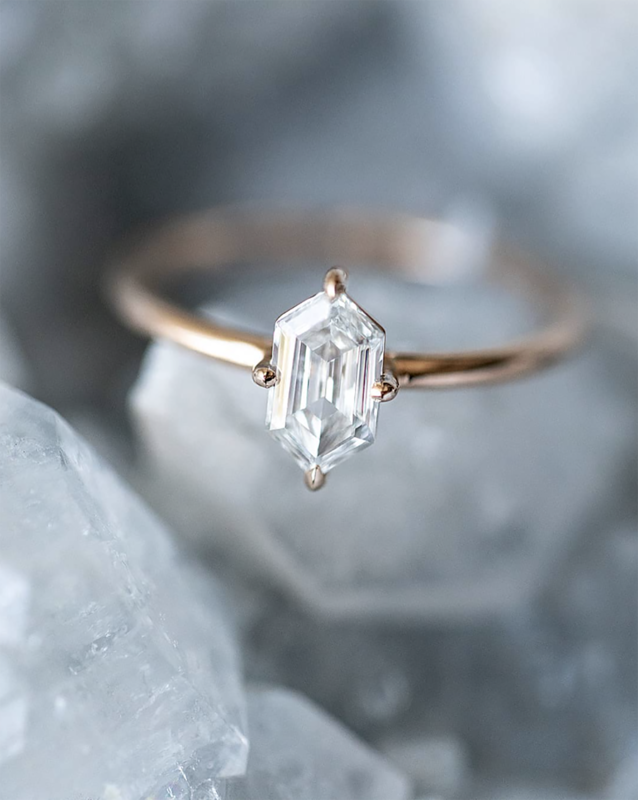 Diamonds are definitely still popular, however the classic, sparkling rocks you might typically imagine of an engagement ring aren’t the typical choice with millennials. Instead, warm and bright champagne diamonds are a popular choice, with the contrasting salt and pepper diamonds offering deep speckled or darker hues. 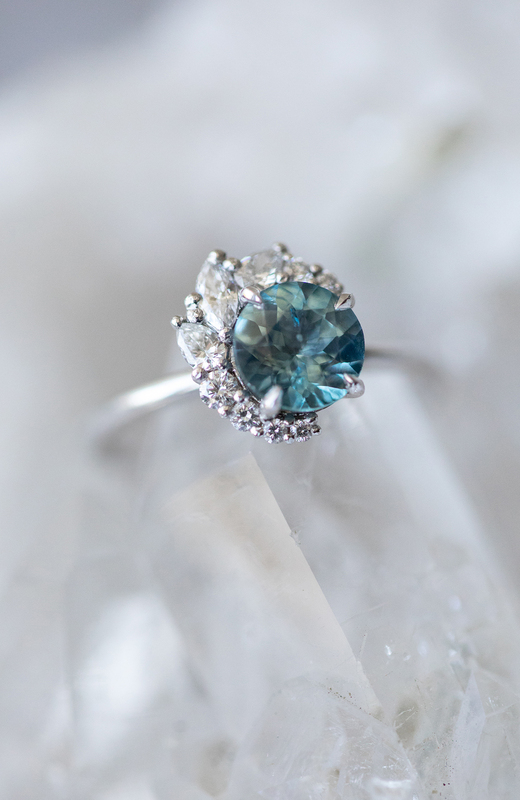 Diamonds aside, boldly colored gemstones such as teal sapphires are rarer and more exclusive. Individuals inspired by the ultra-feminine settings are leaning towards pastel shades set in soft neutral rose gold, or warm yellow gold. Geometric shapes are leading the way forward with jewelry this year. 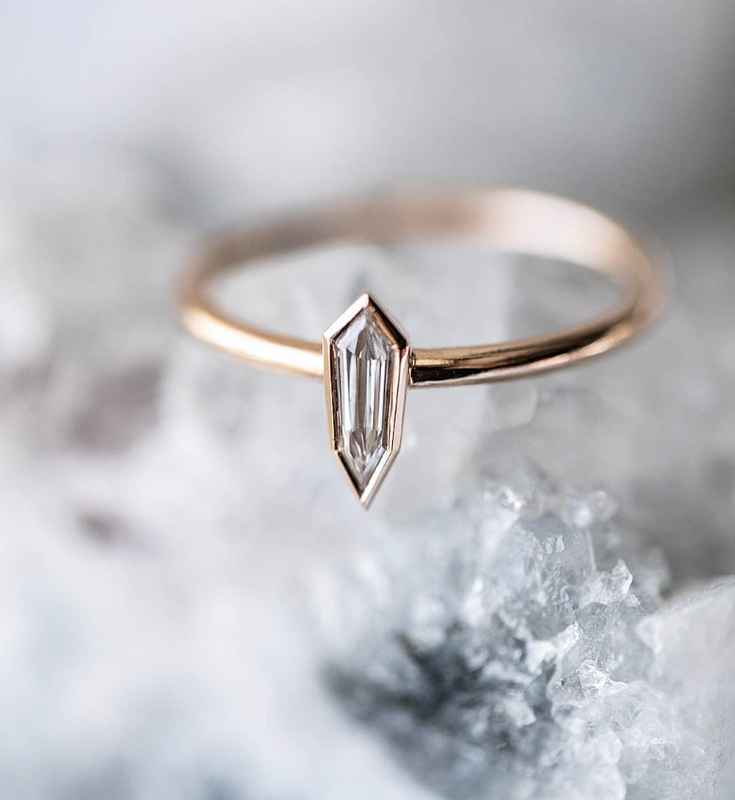 Up until now, geometric shapes have often been overlooked despite being a modern alternative that is both edgy and can make a statement, independent of the stone. We’ve seen a popular trend with millennials when it comes to framing geometric clusters around a hero stone. The clusters often comprise of small geometric shapes that frame around a hero piece, such as a hexagonal stone, or ‘lozenge’ shape (which is like a rhombus or diamond geometrically). Millennial customers are all about fresh ideas, reinvention and custom pieces that reflect individuality. The variety of geometric shapes is starting to spread from kites to coffin-like shapes, lozenges from wide to thin, hexagonal to bullet shapes—the options are endless, especially when coupled with the beautiful variety of colored gemstones. It’s no secret that consumers are valuing brand transparency and experience as an increasing priority. When it comes to purchasing jewelry, it’s clear at Grew & Co that experience and story have an impact on buying decisions and trends. 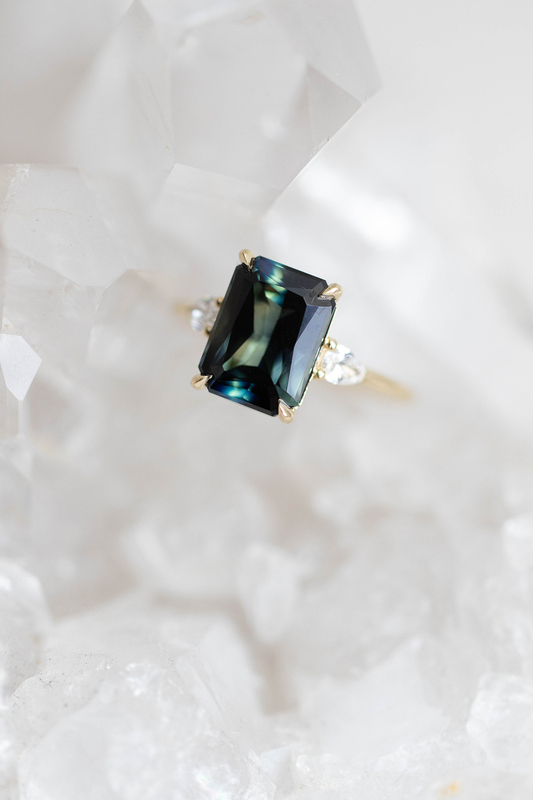 For example, the new ‘traditional’ is a beautiful gemstone in an unusual cut, with a fine modern setting and a rich history or story tied to the jewelry piece. We source Australian Parti Sapphires from families with a long heritage in the gemstone field. Family businesses that have been passed down for generations, or cuts that have been inspired by a particular experience, applied to a one-of-a-kind piece are what is inspiring the millennial crowd. Color: Colored gemstones have the ability to speak to the wearer in terms of the ‘mood’ it evokes. Shape: Brightness can be increased due to a stone’s saturation and cut. Gone are the days you’re limited to one shape, jewelry can be an incredible marriage of traditional and geometric shapes as well as color. Know Your Options: With so many incredible gemstone colors to choose from and the interesting properties of uncommonly promoted and often undervalued gemstones, it’s worthwhile to visit your jeweler of choice to see what is available. It might surprise you! The millennial trends in jewelry are exciting. They are forging the way for more diversity, more artistic portrayal of traditional pieces and ultimately individual expression for the wearer. The opportunities to individualize a jewelry piece are more endless and affordable than ever, and millennials are clearly taking the reins in a bold move away from traditional jewelry. Such good info from Gabrielle at Grew & Co, don’t you think? Also, all those gorgeous rings are from Grew & Co!! 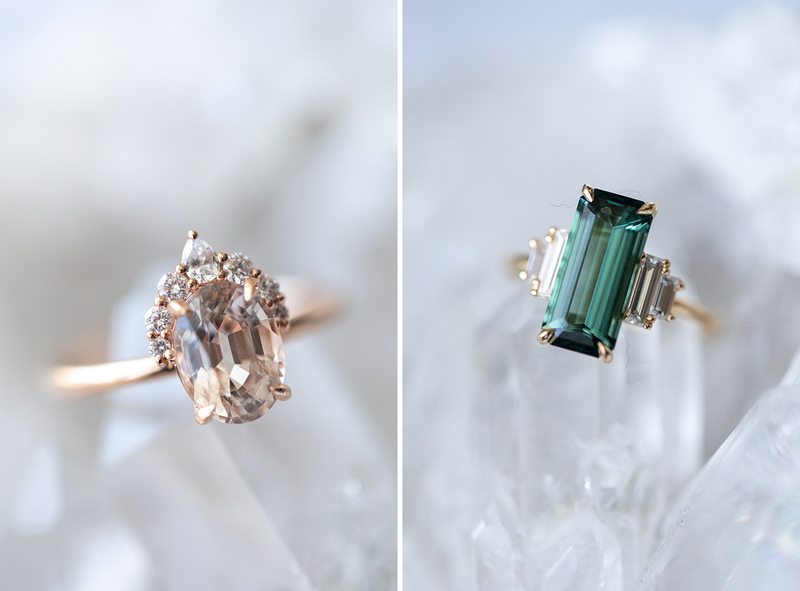 So, we’re curious—are you learning more toward a diamond ring or thinking about a gorgeous gemstone? Let us know your thoughts in the comments below!